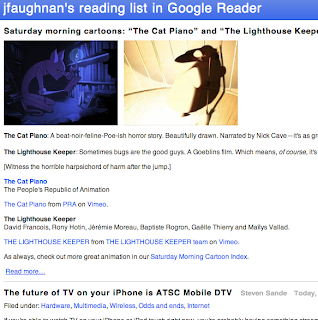 This morning I was experimenting with adding a link to my Google Reader shared (annotated) item feed (see Google Help) as a footnote to each blogger post. That's when I discovered the feed URL on our family news page was bringing up someone else's feed. As best I can tell these weren't items shared by people I follow, they were completely odd. I then visited my GR generated page to get a new feed. That seemed to work - once. Then I tried again and got a no-page error. There's something broken. I'll try posting on the Google help forums -- very, very occasionally someone from Google notices things there. If I paste the latter (feed) URI into bloglines or IE 8, it doesn't work (I assume Bloglines, deceased as it might be, does support Atom. I'm sure IE 8 is supposed to). It does, however, work in the latest versions of Firefox  and Safari and, of course, in Google Reader. So what's going on here? I'm guessing it's some mixture of a weird Google screw up (getting the wrong person's feed) and Google using some Atom feed that IE 8 can't handle. Update 10/17/09: I'm beginning to sort this out. 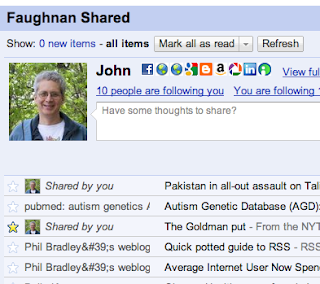 There's a bug in the feed Google provides for the shared item page. The Feed includes items that are not shown on the shared item page. They are not items I've every seen, and they aren't items that the people I "Follow" have shared. They're simply foreign. Not necessarily bad, just not mine. Shared item feed as rendered in Safari. The first two are not items I've seen, after these I do find items I've shared. In FF the link has to start with feed://, in Safari either feed:// or http:// work. So that was waste of Google time, fortunately not too much. I don't know how I ended up with that url in my clipboard. Tonight though it's behaving properly. So I'll just have to watch and see if it misbehaves again.